Instead of scales and measuring tapes, carpenters use their hands and fingers to do all the measuring while building the three traditional huge chariots used during the Puri Rath Yatra. This is really a wonder when considering the height of the highest chariot that of Lord Jagannath is 13.5 meters and nearly 150 carpenters work for three months to build the three chariots using nearly 2200 pieces of wood. The measurements of the chariots as per ancient texts are in cubit. It is based on the length of the forearm from the elbow to the tip of the middle finger. It is equal to around one and half feet. Another measurement used jaba - the width of the mid-segment of the middle finger. Kala Suta - Indigenous scale - It consists of roll of strings of black thread tied to a stick. It is used for measuring and marking. Takera Bata - fixed length flat scale with markings used for making axles. 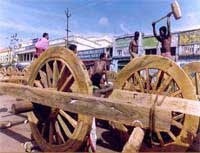 The skills of the traditional craftsmen who build the three chariots are incomparable. They work in unison and present three faultless chariots that are pulled for more than two miles by thousands of people and which is witnessed by nearly a million people.